In the Las Vegas Renaissance Hotel, two service robots—both Relay robots from San Jose-based Savioke—are quietly at work. These robots, named Elvis and Priscilla, are full-time employees of the hotel. These armless robots can’t actually knock. Instead, they robo-call the hotel room and tell the occupant that a delivery is waiting at the door. Elevators are also a challenge—one of the hotel elevators has been adapted to allow the robots to communicate with it wirelessly. You will find robot delivery in more places than hotels. In January, Amazon submitted a patent application for a sidewalk rolling robot. Amazon wants its robot to carry items from a delivery truck to a person’s front porch, or even bring them into a house. It’s part of a wider effort to solve the perennial last-mile problem for any company trying to deliver goods to your door, one that self-driving vehicles are expected to solve over time. Amazon’s patent application describes a robot that has the technological capability to open doors or garage doors, which isn’t far off a trend that Amazon is already pushing with Amazon Key. If that isn’t enough to get your attention, two former top executives of Google’s self-driving car project, Jiajun Zhu and Dave Ferguson, think robotic vehicles that deliver only goods can be ready this year. They believe this, because they are the two co-founders of California-based Nuro. Their startup is building an initial fleet of six unmanned electric vehicles about half the size of a passenger car to carry groceries, food orders, flowers, packages and boxes to homes and businesses in urban and suburban neighborhoods. Nuro has tested conventional vehicles equipped with its autonomous drive software and hardware in California since 2016 to work the kinks out, but is shifting its focus to the small, battery-powered models that look like rolling storage cabinets. While the vehicles aren’t designed to drive on the highway or at high speed, deploying them in other areas such as public roads is dependent on federal and state regulations that are still being finalized. The San Francisco Board of Supervisors may perk up their ears at Ferguson’s comment. In December, the board voted to severely restrict delivery robots that roll on San Francisco sidewalks. Now, startups will have to get permits to run their robots under strict guidelines in particular zones, typically industrial areas with low foot traffic. And even then, they may only do so for research purposes, not making actual deliveries. It’s perhaps the harshest crackdown on delivery robots in the United States. As these events indicate, robot delivery will continue to become a sign of the times. In fact, a report by McKinsey predicted autonomous vehicles in a variety of forms would deliver around 80 percent of all purchased goods in the future. 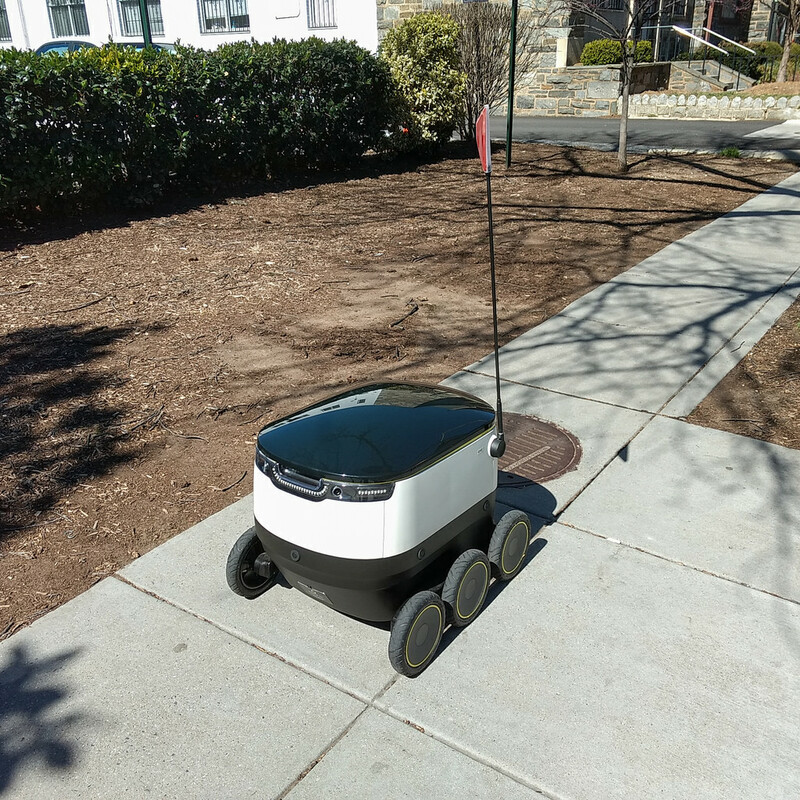 So, you may be sharing your sidewalks, streets and hotel hallways with numerous, non-human forms of delivery sooner than you think.